Finding general reference files is less exact and requires more intuition than naming and saving them. The choice of search tools depends primarily upon how much you remember about the file(s) you need to find. If you are lucky to remember accurate and unique information, Mac’s native Spotlight may be your best search tool. If your information is less certain you may need more advanced tools which are discussed in this post. Before we go to specialized file-finding applications, let’s add a couple of words about Spotlight. It is quick, easy and smart search tool, particularly if you know how to make it more powerful by intelligently defining your Search. 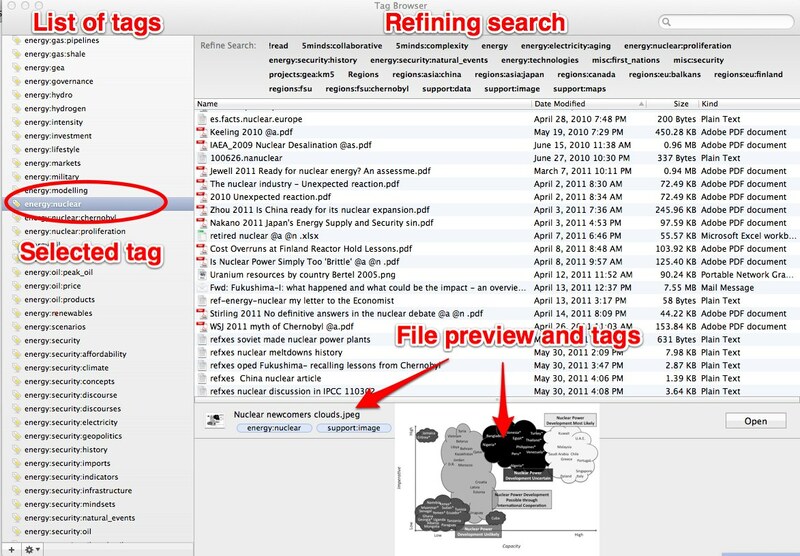 For example, searching for “nuclear” in my Spotlight gives more than 10,000 returns; searching for “tag:nuclear” gives 46 matches and searching for “tag:nuclear kind:pdf” gives 25 matches (all my pdf files with tags containing “nuclear”). You can save Spotlight searches and refine them with additional criteria. And, yes, Spotlight support searching for OpenMeta tags which I use for tagging my reference files and notes. Below is an example of locating files by their OpenMeta tags with Spotlight. Yet some may find searching by Spotlight a bit tedious, cumbersome and not particularly high-powered when you are dealing with thousands of files. Fortunately, there are a lot of alternatives available. Very light-weight Tags ($29) allow browsing your OpenMeta tags, seeing the files tagged with each one and modifying (renaming, deleting, adding, re-attaching) tags. You can also refine your search within a particular tag by specifying additional tags or the item’s name. The Tags interface is shown below. Particularly attractive is Tags’ ability to tag any item (a file, an iPhoto image, an email message, a contact, a calendar event) by pressing a global tagging shortcut key (for me Ctrl-T). Imagine, you’ve just spent 5 min looking for a file which was not tagged properly and you want to add or change its tags to make your future searches more efficient. Just point to the file in Finder, press Ctrl-T and play with the tags! The disadvantages of Tags is that you cannot save your searches or make them particularly sophisticated. Thus, I use Tags primarily to quickly add or modify tags rather than to search for my files. Leap ($25) by Ironic Software is a complex file management system, called by its creators ‘Finder 2.0’. Leap supports truly sophisticated queries which are much more accurate and powerful than those generated by Spotlight. If lost a file (which usually means it has been misplaced) I always use Leap. It may take some time, but I know the file will be found. Similarly to Tags, Leap allows modifying tags on your files and renaming, deleting or adding tags to your system. At one point Leap was my favorite application for storing and finding reference files. However, I found that it is too distractive for simple routine searches which I need to perform several times a day or for routine tagging (for which I use DefaultFolderX or Tags). There is also DevonThink (from $50) by Devon Technologies, a complex, advanced and highly rated system for managing ‘everything’ from files to notes, bookmarks, email messages and RSS feeds. At one point I gave up on DevonThink because it was too slow and resource-consuming. Now with a faster computer, I resume experimenting with it again. However, so far I mostly use DevonThink for productive procrastination, i.e. re-arranging my tags and reindexing my files. It is probably a better tool for auditing and continuously improving your file organization system rather than for efficiently searching for files. Currently, my favorite search application is HoudahSpot, the ‘Spotlight Frontend‘. I learned about it from MacPowerUsers and though I am still experimenting, it seems to be a great combination of the speed of Spotlight and the power and user-friendliness of more complex applications. One of its greatest features is the ability to customize, save, and quickly call up sophisticated search queries based on templates. For example, you may have saved a query on all scientific articles which concern a particular topic but suddenly you need to search for research notes related to the same topics. You can quickly call up your query and change the type of items you’re searching for (and save it as a new query if you wish). However, HoudahSpot is a tool for searching, not organizing files. Thus, though you can easily search by OpenMeta tags, you cannot modify tags or tag the files. Learn how to use Spotlight for easy fast searches. It will do the job just fine in the majority of cases. Try HoudahSpot as your main search tool for routine complex searches. Use Tags, Leap or DevonThink to continuously improve the organization of your files. Without this continuous adjustment your file organization system will eventually get out of sync with your mind and become useless. This entry was posted in Files and tagged DefaultFolderX, DevonThink, OpenMeta. Bookmark the permalink.